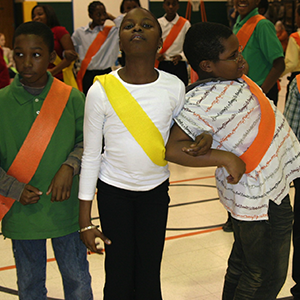 Dancing Classrooms students are taught the colorful vocabulary of various social dances in a classroom setting. The classes reinforce elements of the academic curriculum including geography, math, science, social studies, writing, art and physical education. Against the alarming rise of gang activity, absenteeism, obesity and Type 2 diabetes among school age children, Dancing Classrooms introduces a healthy, wholesome and engaging cardiovascular activity for both genders, with the potential for lifelong enjoyment. Dancing Classrooms culminates in a “Colors of the Rainbow” gathering geared toward families and friends, which may be an evening dance for students with their parents, an assembly presentation of dances by students which includes their writings and artwork, or a Ballroom Breakfast with parents, teachers and friends. Our classes serve a diverse population of children and cultural backgrounds. There are no pre-requisites and experience is never required. In Dancing Classrooms, we follow the highest standards of excellence to ensure a successful and meaningful experience for each student. For more information, click on the BRING DANCING CLASSROOMS TO YOUR SCHOOL under GET INVOLVED or call Ann Guill, 336-409-0672.